Getting creative is a super important component of your family’s mental health. And if you’re like me, any tips from others on how to be creative with your kids is welcome! First, you don’t need to be an artist or musician in order to reap the benefits of regular creative pursuits. Researchers have reviewed studies that used art, writing, music and theatre for the purpose of healing, not mastery, and found these creative activities reduced participants’ stress, anxiety, depression and negative emotions. Creativity is particularly important for kids. It gives them the opportunity to be inventive, to take risks, to practice self expression and to problem solve–all important life skills. What’s more, the creative process teaches flexibility as children make decisions without being certain of the outcome. Many benefits of being creative stretch from childhood to adulthood. Older children involved in the arts often have better academic outcomes.And being part of a performance art can create a positive social network that gives young adults and teens a sense of belonging. Finally, o ur emotions and feelings are communicated through creative expression, and the creative process can actually hone our communication skills. I’ve found the best way to encourage creativity in your children–and help them to reap these benefits–is to model it yourself. Dedicate time each week to get creative, and encourage your children to join. 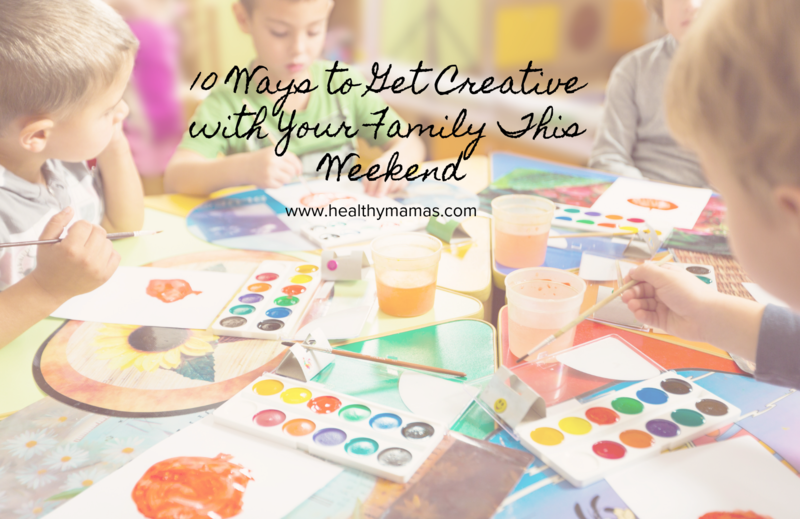 To get you started, here’s a list of 10 easy, accessible ways you can get creative with your family this weekend. I love this list and keep it handy when I’m stumped for a fun activity with the kids – enjoy! Art, especially with young children, can be a mess. Instead of cringing, work with your kids to create an art space where it’s OK–encouraged even–for them to get messy, loud or whatever their pursuit requires. Protect the furniture and carpets in that space so you don’t need to hover over your kids to tell them, say, to be careful to keep their paint on the paper. Set up a music area in the basement, where it won’t interrupt conference calls. While you’re at it, make the space inviting with great storage and all their tools easily accessible. Visit a craft store to get the right organizers for the items so it’s easy for them to pull them out and start creating. No matter the age of your children, there’s something for everyone when it comes to building a town, or whatever fantasy world they prefer to create. For younger children, magnetic tiles, blocks or train sets can be great for this. As the kids progress, LEGOs, Tinkertoys, bristle blocks, model trains, planes or cars or any manner of building blocks can be incorporated. This is a great activity for mixed-age groups. The younger kids can create the airport hangars from blocks or magnetic tiles while the older ones build the planes from LEGOs, Tinkertoys or a model kit. Many local craft stores offer jewelry making classes so you can learn a new skill. Try craft chains or local independent shops and select a class that suits your style. Local Home Depots have workshops for kids and adults alike. Kids can make things like birdhouses while adults can learn everything from how to make a succulent frame to how to tile their backsplash. More details on workshops at your local store here. Plaster and pottery shops are popping up all over the country and are an increasingly popular pastime for kids and adults alike. The concept is simple: visit the shop, select the piece you like best and get to painting. All the supplies are provided and the mess is cleaned up for you. You may think a theater performance is out of reach if you have young kids, but there are child-friendly performances of plays all the time. Pro tip: pick a show that your kid has seen in movie or book form already to help keep their interest. Check out local high school or community theater performances, or kid-friendly matinees of professional theaters in your area. Many kids have experienced a makerspace at school or the local library, and it’s a great, free way to exercise creativity. Spend your weekend on the hunt for items to create your own makerspace, from loose buttons to empty paper towel rolls. Looking at everyday items and even trash in a new light is a creative act itself as kids envision what they can make from them. Tie dye can be a messy experience, so this is a great one to do in your safe art space or, if possible, outdoors. But kids love seeing colors blend together as they tie dye, and kits available at local craft stores break down the different options for designs to make it easy. Plus, you can wear your art with pride when it dries. There’s always a holiday coming up, whether it’s a big one like Christmas or a small but fun celebration like St. Patrick’s Day or Independence Day. If there’s no nearby holidays, seasonal decor will do. Scour craft stores for on-theme stickers and other items, or use what you have around the house to create wreaths, paper chains and garlands, greeting cards and more. Thanks to smartphones, all of us can create a movie or music video! Work with your kids to plan out a storyboard, song, dance or musical performance. If you’ve got the time, create sets and costumes too. Then film it all and project it onto the family TV so you can watch the fruits of your creative labor.